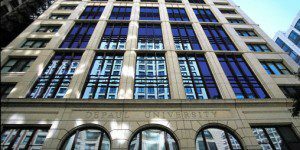 DePaul University’s Charles H. Kellstadt Graduate School of Business, named for the former Sears, Roebuck and Co-Chairman, President and CEO who offered a $9 million endowment gift to the graduate school in 1992, is part of the university’s Driehaus College of Business. The university has offered a MBA program since 1948. Founded in 1912, Driehaus is one of the ten oldest business schools in the country. In 2012, its centennial year, the college received a $30 million gift from DePaul alumnus Richard H. Driehaus. To honor his longtime partnership with his alma mater, the college was renamed for Driehaus. Kellstadt is accredited by The Association to Advance Collegiate Schools of Business International, a distinction earned by less than five percent of business schools worldwide. Kellstadt offers courses at the downtown Loop Campus and two suburban locations. Loop Campus, located at Jackson and State streets, is the main hub for all full-time MBA classes and is located a short walk from Chicago’s business district and main cultural institutions. The O’Hare campus offers courses for the Part-Time and Weekend MBA programs, while the Naperville campus offers only courses, primarily on weekday evenings, as part of the part-time MBA option. Conveniently located near O’Hare International Airport and the north and northwest suburbs, the O’Hare campus offers modern student services at the center of this international transportation hub. Naperville, the largest of DePaul’s three suburban campuses, has been open since 1997 and has its own library, computer labs, auditorium, 27 classrooms, and access to free parking. Kellstadt shares facilities with the DePaul undergraduate business program in the DePaul Center, 1 E. Jackson Boulevard in downtown Chicago. The 11-floor building, the lower two floors of which contain a full-service Barnes & Noble Bookstore and an array of other shops and eateries, houses the DePaul Student Center on its top level. There are more than 300 full-time and part-time faculty members at Kellstadt. The student to faculty ratio is 12:1 and the average class size is fewer than 40 students. Notable faculty include Werner De Bondt, a pioneer in the behavioral finance field; Kelly Richmond Pope, a Chicago Tribune “Remarkable Woman,” who’s innovative classroom and scholarly work focuses on forensic accounting; and Jose Liberti, a three-time winner of the Brattle Group Prize given by the Journal of Finance for his writing on corporate finance. The most recent Kellstadt class featured 2,190 students. Fifty-two percent identified as female and 30 percent were minority students. Sixty-one percent were full-time students. Thirteen percent of students were under the age of 24. Kellstadt offers full-time, evening, and weekend MBA programs. The school offers 14 concentrations, and students are invited to customize their degree to their unique interests and professional goals.